India has overtaken the U.S. as become the world’s third largest producer of steel with the production of 14.56 MT (Million Tones) in first two months of the year. From the last five years, India was the fourth largest producer of the World by following the China, Japan and U.S. but now India has overtaken the US and become the World’s third largest producer in the world. 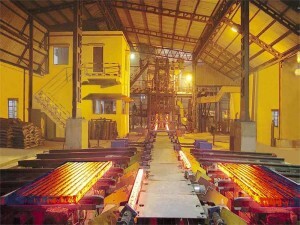 The data was compiled by the WSA (World Steel Association) represented that the India’s steel production growth was so highest in the months of January and February at 7.6% in the comparison of the world’s steel production as an average of 0.6% at 127.6 Million Tones. Steel produced by China accounts for nearly half of the World’s steel production fell by 1.5% during the period. In this period, China produces 65 MT steel. Japan is the second largest producer of Steel in the world that reports a total production of 17.4 MT but the output fell 2.2% in the country during the period of January and February. The US was the third largest steel producer in the World since 2010, but its total output of steel was only 13.52 MT during the same period that let away its position to India. On a yearly basis, India may keep the position proved that so many capacities are set to be specially made during the year from its present established manufacturing capacity of a pretty over 100 MT. On the other hand, production in the U.S. is the caption for stagnation with no indications of growth in the instant future. Production in the U.S. has been a balance between 86 MT and 88 MT for the last four years. The gap of production between the two countries i.e. India and U.S. was just five MT in the last year. Fascinatingly, the U.S. snatched the third slot from India in 2009.